We used this gun at the Nats warm up this past weekend and it was flawless. It didn't leak, filled the car very fast, and was easy to read the quantity of fuel used. I liked the twist on cap also. This is the best gun I have ever used, and I have used a ton of them.. not to mention pitting one guy to a World Championship. This is the gun to have.. trust me. Not sure about the bad reviews or guys who say it leaks, it doesn't. I have 3 of these guns and none of them leak, and they have all been working for a long time. The tubes inside are impervious to the fuel, as opposed to some manufacturers who use brass tubing. Stay away from guns with brass tubing inside, the nitro destroys them. A+ for Protek RC on their super good fuel gun. The ProTek fuel gun works extremely well in all situations. It's well built and provides a very accurate fuel reading. Every second counts in those long mains. 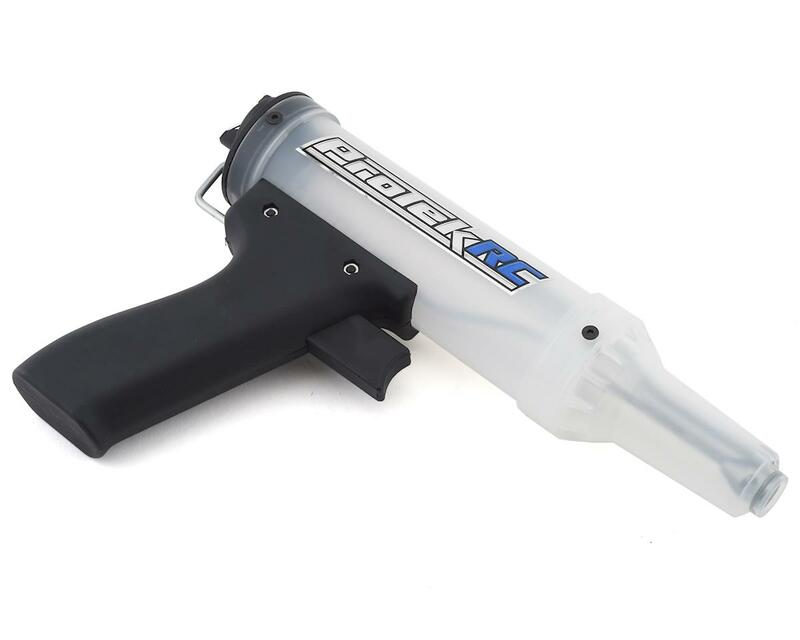 The ProTek fuel gun is a must if you're serious about racing. There is no better fuel gun for the price and quality. First time I filled the gun it leaked from the nozzle and it poured out the top cap when on its side full of fuel.Removed the 2 srews that hold the top cap in and pulled the cap off to check the oring, there is a groove for an oring but there was no oring. I have made a stand the holds the gun so it does not leak. Gun is quick and works well but I would buy the Losi gun if I was goping to purchase a new gun. Mate bought one after using my Protek, does not spill a drop even when turned upside down. Really good fuel gun to have when your in a close race! and a lot more easier for your pit guy! Got this so my pit man would stop spilling fuel when refilling my truggy. It works great with no leaks and it fills fast. I made my own stand with some pvc pipe. I would recommend this for anyone wanting a great gun and tired of their pit man spilling fuel all over when refueling their car. The aluminum tubes we're plugged with glue at the top, other than that works great. The manufacturer needs to glue under the little plastic piece instead of the top problem solved. I used a drill to clear the tudes. Also leaks where the shaft enters the top cap an o-ring or two would solve that. Two issues=-two Stars all around good product just poor manufacturing process. Great for the price! I've used it for 5 straight weekends and it has not let me down. A must have to quicken up your pit stops. This fuel gun works great. It's tough enough for travel and its super fast. Keeps my car clean during long mains and fills the tank every time. The measurements are clear so run time can be calculated. Top notch. 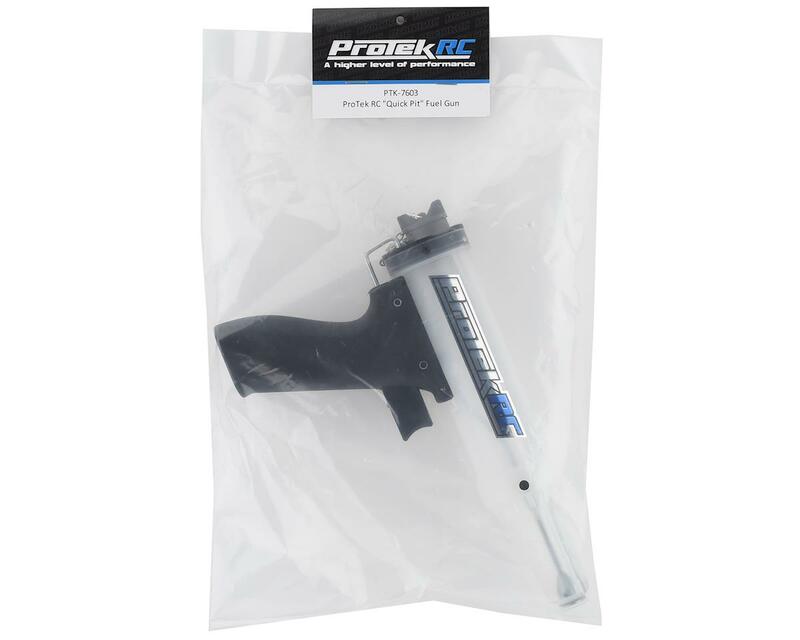 I have always had a good experience with Protek batteries, but was very disappointed when I got this leaky fuel gun. Won't buy another Protek product other than their batteries. Few days ago, I take my fuel gun from the post office, after that i open the pack with it. Then i tried to purge with air alu tubes in gun, but i can`t do this. After that i dismantled my new gun, and saw some plastik inside of alu tube. Then i warmed up all tubes to melt plastik. And only after that all tubes began to blow. I think that this is not a quality product. Great fuel gun. Easy, fast, no leaks! Pitman approved. I used this gun last weekend for one of my buddies and it worked great. No problems. One man pit stop was still really quick. So I bought one the next day.